Mark Hancock, BSc (Hons). Special Send-offs is his creation, and is dedicated to his late mother in law, Muriel Humphrey (Mu). When Mu died in 2015, after a long battle with Alzheimer’s disease, Mark realised that his wife’s family were moving towards the standard sort of funeral that would have been totally at odds with her character. He had read the ‘Do it yourself’ guide on the GFG website, and he offered to organise the funeral for the family. Years before, Mark had seen a Channel 4 programme called ‘Dead Good Job’ featuring different kinds of funeral directors. One of them was Carl Marlow from Tyneside, whose untypical undertaking company had a focus on fair pricing and openness. Mark contacted Carl to buy a coffin for Mu, and, several conversations later, Carl assisted with the practicalities of collecting and moving Mu, charging a minimal amount for doing so. Intrigued, Mark then spent time working with Carl, and the idea of creating his own funeral business took form. Carl continued to act as a mentor as Mark progressed towards opening his own company, and much of the ethos, openness and fair and transparent pricing that makes Special Send-Offs stand out from other funeral businesses in the area echoes Carl’s approach to funerals. The result is a new Scarborough funeral directors, with premises that are bright, light and aesthetically inviting, with a fresh new approach to undertaking that puts clients at the heart of everything. We first heard from Mark in early 2017 when he approached us to explore the idea of becoming recommended by the GFG. At that time, he was just starting out; his fledgling business had carried out three funerals, and he had acted as an advisor to a couple of other families who wanted to organise funerals themselves. Fast forward to the end of 2017, and Mark felt the time was right to undergo our accreditation process, so we arranged to visit him in the quiet days between Christmas and New Year. What we found was delightful. 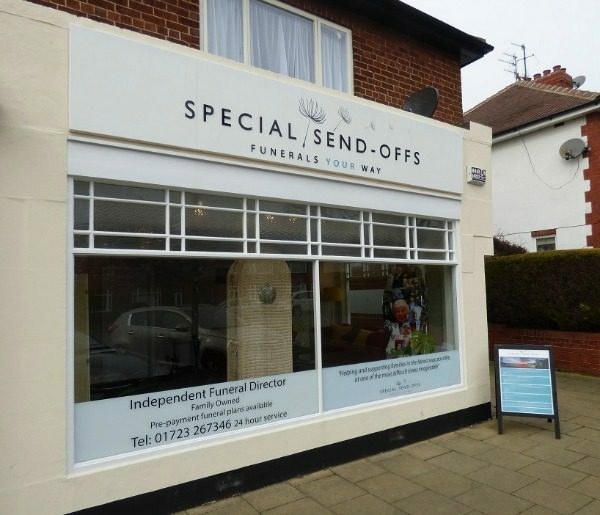 Set in a small parade of shops just outside the main town, Special Send-Offs is immediately apparent as a funeral directors with a difference. The big windows invite you to glance inside past colourful flower displays as you pass by. An A-board is set by the door with the prices clearly listed so you can see before entering the exact amount of money that a Special Send-Offs funeral will cost, and the choices that you have. Stepping inside, you find yourself in a large, light space; colourful orange sofas are set around a small coffee table, and Mark’s desk is at the far side of the room, but the main focus is on the stunning picture coffin where hundreds of snapshots of Mu smile back at you. It is displayed not only in tribute to the woman who inspired Mark’s journey, but also as an example of just one way in which you can ensure that the funeral you are planning can be made totally personal. Other coffins displayed in the reception area are also unlike the norm that you might expect – one is covered with colourful dots, another is a white willow coffin with a bunch of dried lavender as decoration. Two cream screens can be unfolded to provide complete privacy for a family making funeral arrangements if Mark feels the light band of frosting on the windows is insufficient, and a number of thank-you cards stand on the coffee table. Reading some of the messages, with handwritten words spilling over both sides of the card, it is evident how much impact Mark’s thoughtful approach to organising funerals has had on so many people. Over and again the writers emphasise how grateful they are for the support and kindness they received and how glad they were to have participated in such a special occasion. Beyond the reception area is another large room where families can spend time with the person who has died, or where small ceremonies can be held. The soft grey of the walls is set off by bright white paintwork, daylight spills through the frosted windows and candles are placed on the windowsills and ledges. Adjustable lighting means the light in the room can be changed to suit, and many families have chosen this space for the funeral ceremony rather than the impersonal feeling of the crematorium chapel. Families decorate the room as they want, they can bring in drinks and have speeches with toasts and play whatever music they want – the room is theirs to do with as they wish. The week before we visited, the wishes of a lady had been honoured by three of her family members (and four dogs!) attending a small evening ceremony with her coffin surrounded by flowers and candles. There are no time restrictions for ceremonies on the premises either, something which many people appreciate. Beyond the door at the back of the room is the functional part of the business, a store room and a mortuary area, and space where Mark’s car is garaged. It is all secure and self-contained, and the company’s dandelion symbol seen on the website and the frontage of the building recurs here behind the scenes too. Mark believes strongly in encouraging families to participate in the process whenever he feels it is appropriate. “Many funerals turn families into spectators, but I encourage involvement,” he says. In addition, Mark always offers the lowest cost options first to families, which is very different to many other funeral directors. Mark’s whole approach to funerals is different to most other undertakers. He has chosen this role after seeing for himself how profoundly important a good funeral can be, and realising that many people don’t get the opportunity to organise one. Your first call will be answered by Mark. If he’s unavailable his wife may answer the phone or be in the premises to greet you, but 99% of the time it will be Mark you speak to and who looks after you. Home visits – yes, whatever suits you, Mark is happy to come and meet you at home if you’d prefer. Embalming? Mark doesn’t believe it to be necessary – ‘and I don’t like the way people get charged for it’. Ethnic specialism? No particular specialism, but nobody would be turned away, and if Mark was unsure of what a particular family required, he’d ask. Home arranged funerals – yes, Mark has helped a number of families wanting to make most of the arrangements themselves. Local celebrants – Mark can suggest a selection of celebrants that he thinks might be right for you and your family. Website – Really nice website, fresh and colourful with plenty of good information. Client support – Throughout the period leading up to the funeral and beyond, Mark is entirely there for you. Following the funeral, where appropriate, he can put you in contact with bereavement support if you feel you need this. Money matters – Clear, easy to understand pricing. Special Send-Offs have three all-inclusive options with all the elements of each laid out so that you can choose the most appropriate one for you. If you want a completely bespoke alternative, Mark will go through all the costings with you as you outline your wishes. Parking – Free parking outside. Marks’ dedication and passion for his work is palpable, and he is clear about what he is trying to achieve – ethical, meaningful and affordable funerals for everyone. He guides families through the plethora of choices, giving sound advice where needed, and being completely supportive of whatever decision you make. He works closely with experienced staff, who he hires in as needed, meaning that he has all the benefit of knowledgeable support when required, without the overheads to pass on for his clients to pay for. His premises are lovely, and the personal attention you will receive if you choose Special Send-Offs is outstanding. We don’t think that you’ll find a better, more affordable or more dedicated funeral director anywhere else in the area.